“It’s really very much better.” Says Kevin Badger to anyone who’ll listen. 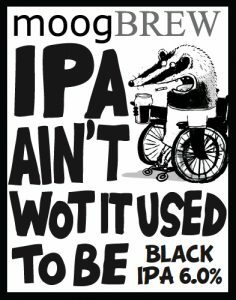 As Kevin points out, this Black IPA is no oxymoron. He calls it a Cascadian Dark Ale. All the hoppy bitterness you’d expect from a regular IPA with a little roast malt taking it to the dark side. Which is where you’ll find Kevin. Join him for a chat. His knowledge of beers and all things trivia is truly Wookieepedic.